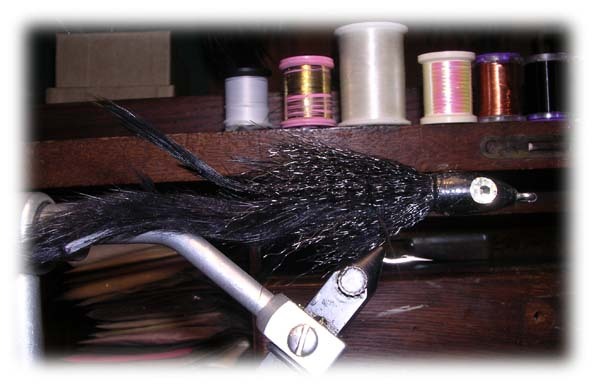 The key to this fly is the ridged collar created by the flared Supreme Hair. What this does is two fold. 1.) It protects the both the bunny strip and saddles from fouling by creating a cone-like area and 2.) Most importantly is the Pusher, pushes water. When the synthetic is tied in as clumps on each side of the hook, it naturally flares-out as you tighten it in. Once you get it secured, zap it and then build a nice taper with either thread or ultra chenille. Once a taper is made, wrap in some eyes with clear mono thread or glue in. Then epoxy and let dry. I chose black to display since it is one of my favorite nighttime flies. Especially when fishing down deep with a sinking line in the currents of an inlet or channel.